Don't just do digital. Be digital. Tricia Wang, PhD, inspires Analytics Experience attendees to get to know their customers digitally. If you were to ask Tricia Wang, PhD, about real business growth, she would tell you that it lies outside the boundaries of the known. Not everything valuable is measurable, she would say. And big data is hiding new customers in the market from you. 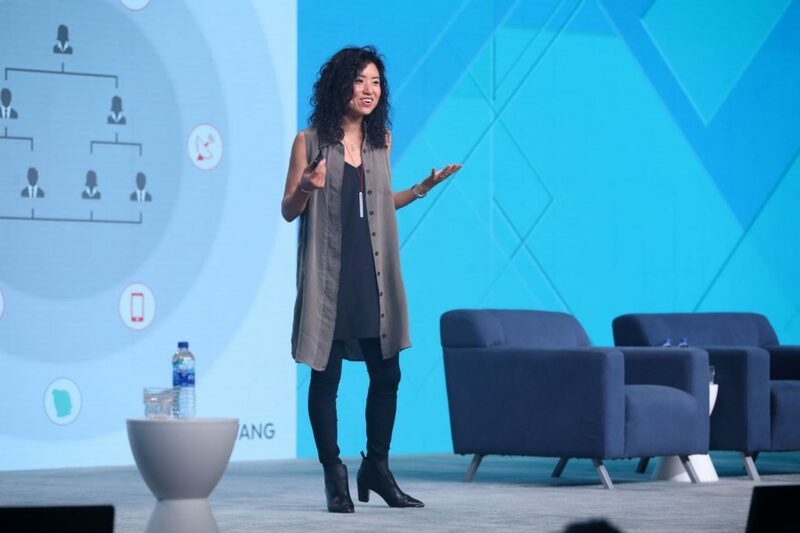 Wang is more than just a global technology ethnographer and the co-founder of consulting firm Sudden Compass and content and strategy company Magpie Kingdom. She is a business-savvy, eagle-eyed business detective, helping organizations to find new customers hidden within existing big data stores. Businesses believe that digital tools can help them get things done better and faster. Their underlying belief in digital transformation is that digital can help them make radically better decisions, but the fact is that most big data projects are wildly unsuccessful. Why are big data projects such an epic fail? We’re not cavemen. We have technology. So, why are 85 percent of all big data projects not profitable? Why is it so hard for us to get the full ROI value out of our big data investments? Wang has the answer: investing in big data is easy, but using it is hard. The job of data scientists is not just to pull numbers out of their data but to use their data to tell stories that can help their businesses flourish. Wang works in the fields of data, design and the world of digital to help organizations succeed at digital transformation by unlocking the human insights of big data. I’m here to talk about what big data doesn’t tell you – the difference being doing digital and being digital. What works? Capturing the precious data on human emotions and stories. Wang calls this thick data. This human-rich data can help organizations avoid the illusion that they have a data strategy that is leading them to better decisions. Even with the right tools to develop innovative solutions, faulty data can lead organizations astray and mislead their own teams. Wang’s theory for why this is happening may seem aggressive or controversial, but it’s really very simple: When company-centric organizations invest in digital, they actually end up understanding less about their customers. Companies can succeed at innovation but still fail in the end at decision making if they don’t understand how the human experience plays a huge role in digital transformation. Want to understand how to keep the human element in your digital strategy? Check out Dr. Tricia Wang’s keynote speech above. Thick data helps you ask the right questions that will lead you to better decisions because when customer-centric organizations invest in digital, they understand more about their customers. Company-centric and customer-centric? What’s the difference? Customer-centric organizations are set up so that customers are always at the center of what their teams do. These teams are designed to build true passion for the customer, to gather real and relevant thick data, and to apply that thick data every step of the way. In these organizations, customers are infused into the company culture, and adding digital tools only brings these teams closer to their customers. These data scientists are best able to utilize quantitative tools to activate an understanding of human behavior out of their data. But some organizations are still treating digital as a purely technical thing and missing the human insights in big data. By losing this human element, company-centric companies are at risk of losing touch with their customers. Like the now-bankrupt Kodak company, they face losing relevancy, losing accountability and eventually losing their companies altogether. What needs to change for success in the digital age? Integrate big and thick data into a single holistic story. Bridge the technical and non-technical gap because tools alone do not guarantee success. Build data models closest to human models in order to turn qualitative understanding into something quantitative and scalable. Some people, Wang insisted, might think that artificial intelligence (AI) is a great way to skip the human element and go straight into the data models. But she would caution against this. The best use of AI would be to build data models closest to human models because AI gives organizations the opporunity to elevate the role of humans in technology rather than alienating them from the conversation entirely. Wang issued a challenge to all organizations: Don’t just do digital – be digital. Businesses and teams need to change the way they operate to become more effective at leveraging their data. By embracing the difficulties of digital transformation and transforming their data into human insights, forward-thinking organizations and people will be at the forefront of the Data 3.0 era. Learn more about big data and digital transformation. When she is not combing the Eastern Seaboard in search of new things to do and new places to visit, Stephanie is a writer, copyeditor and grammar aficionado at SAS, helping to bridge the gap between messaging and consistency for the SAS brand. A big part of what she does every day is helping people find better ways to communicate with one another and our customers.